Have you got it figured out? Yes, there is going to be a theatrical run of The Beast of Bottomless Lake next month. It is going to be small and more than likely short - like a week, but who knows if things go well. 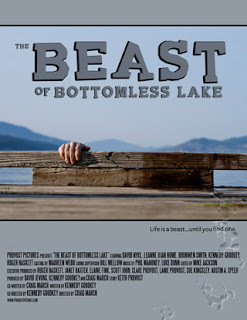 Landmark Cinemas has chosen three theatres in the Okanagan Valley to run Beast in starting September 9th. Specifically, the Paramount Theatre in Kelowna, the Capitol Theatre in West Kelowna, and the PenMar Theatre in Penticton. We are currently working on a gala preview on the 8th with special appearances and stuff - more news on that as it happens... to be clear, the gala part is not 100% certain yet, but keep your eyes here for details - they will be coming soon. August 31, 2011 at 5:39 p.m.